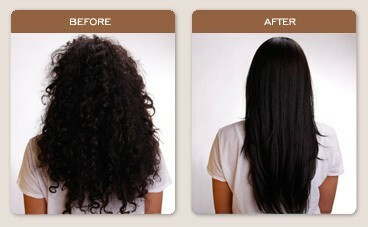 The Brazilian Blowout is the ONLY professional Smoothing Treatment that improves the health of the hair. No Damage! Leaves hair smooth and frizz free WITHOUT harsh chemicals. This treatment is individualized and there is NO DOWN TIME! The minute you leave the salon, you can wash and dry your hair! A good candidate for the Brazilian Blowout is anyone who has frizzy, damaged or processed hair. With proper communication and a well considered application, everyone can benefit from the Brazilian Blowout smoothing treatment. Q. What kind of look is created with the Brazilian Blowout? The hair will be totally frizz-free, shiny, effortlessly manageable and with plenty of body and bounce. The hair can still be worn curly/wavy (depending on the hair type) and you will have the freedom to blow dry hair smooth and straight in a fraction of the time invested prior to receiving the treatment. Yes! The Brazilian Blowout will actually improve the health of color-treated/highlighted hair by conditioning the hair while sealing the cuticle for enhanced color, reduced frizz and radiant shine. If your hair is wavy, the Brazilian Blowout will make your hair appear naturally straight and healthy. If your hair is very curly, it will minimize frizz while enhancing the appearance of the natural wave/curl. 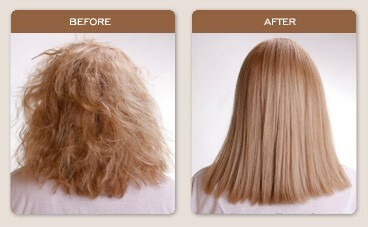 If you have straight, frizzy hair, this treatment will eliminate frizz and promote radiant shine. The Brazilian Blowout typically lasts 10-12 weeks. The Brazilian Blowout is a cumulative treatment, so the more you receive it, the healthier the hair will be and the longer the result will last. Q. Can the Brazilian Blowout work on top of other relaxers and strengtheners? Yes! The Brazilian Blowout actually works best on chemically treated hair, and helps to improve the condition of the hair by fortifying each strand with essential amino acids. The Brazilian Blowout is great for someone who is trying to move away from relaxers or Japanese straighteners because it puts movement back into the hair, allowing the hair to look its best. No, your hair will not lose volume as a result of receiving the Brazilian Blowout treatment. Your hair will maintain its' natural volume and you will still experience great bend and memory when blow-drying and/or using a curling iron. Q. Will my hair return to its' original state after the Brazilian Blowout treatment has completed its life cycle? Yes, the hair will revert to its' original state once the Brazilian Blowout treatment has completed its' life cycle of 10-12 weeks. However, the condition of the hair will actually improve as a result of the fortifying and conditioning nature of the product. Q. Can I color my hair the same day I receive a Brazilian Blowout? Yes. However, you must color your hair prior to having the Brazilian Blowout smoothing treatment. If you are coloring hair dark brunette or red, you will want to color the hair a shade darker than you otherwise would, as the hair color will experience fading during the Brazilian Blowout treatment. Q. Can I swim in the pool or ocean after I have the Brazilian Blowout treatment? Yes, you can swim in either the pool or the ocean after you receive the Brazilian Blowout treatment. However, the treatment may be slightly compromised if you swim on a regular basis. We recommend that you receive the Brazilian Blowout treatment prior to swimming in order to act as a protective barrier and maintain the smoothest possible result for the longest period of time. Q. How soon can I color my hair after I receive the Brazilian Blowout Treatment? You should wait at least two weeks to color your hair after you receive the Brazilian Blowout because the color will not deposit as effectively with the protein protective layer provided by the smoothing treatment. It is ok to touch up color/roots between treatments because in this case, the hair being touched up is new growth and does not have the treatment on it. You can wash your hair immediately after the Brazilian Blowout treatment. Q. Can I receive the Brazilian Blowout if I have extensions? Yes, the Brazilian Blowout performs perfectly on hair extensions. However, it I best to treat the extensions separately with the Brazilian Blowout treatment prior to putting them into the hair. There have been no clinical tests performed on the safety of performing the Brazilian Blowout on pregnant women or women who are breastfeeding. As a result, we advise that you refrain from receiving the Brazilian Blowout Treatment if you are pregnant or breastfeeding. Q. How soon can I receive a Brazilian Blowout treatment again after I receive my first treatment? The Brazilian Blowout is just like a conditioning treatment, so you will not harm the hair by receiving them too soon or too much.